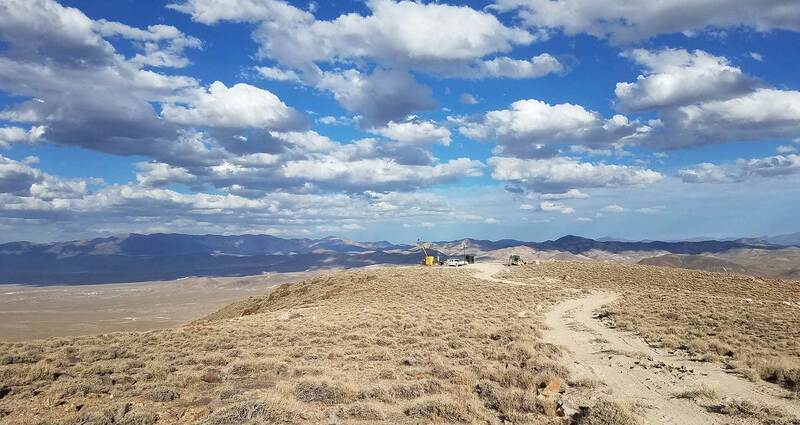 Patriot Gold Corp., a developing gold and silver production and exploration company, today announced positive bottle roll cyanide leach test results from drill holes B-1201 and B-1207C at the Bruner Gold project located in Nye County, Nevada. Positive results indicate that there is no material difference in gold solubility from samples ranging from less than 200 feet to more than 500 feet below the surface. The bottle roll cyanide leach tests completed were on composite coarse reject drill cuttings from two drill holes, B1201 and B-1207C, from the 2012 exploration drilling program on the Penelas East discovery area of the project site and returned an average of 97% gold extraction from 21 composites to 80% passing 200 mesh screen size. "We are very pleased to report these latest metallurgical test results. Not only was practically all the gold soluble in cyanide, but with very low cyanide consumption and leached within a 48 hour timeframe," said Karl Boltz, Vice President of Business Development for Patriot Gold. "We are also encouraged to see strong silver solubility which will be a nice added bonus to the Bruner project economics. Going forward, additional bottle roll tests will be performed as we continue to quantify the metallurgical characteristics of the gold-bearing material at the Bruner project site." These tests were run to assess the cyanide solubility from two holes which demonstrated a wide range of grades and vertical extent of gold mineralization within two distinctly different rock types. The positive results indicate that there is no material difference in gold solubility in samples ranging from less than 200 feet below the surface to samples from greater than 500 feet below the surface, no difference in gold solubility between head grades from 0.01 opt Au (0.34 g/t) to 0.64 opt Au (21.94 g/t), and no difference in solubility between gold hosted in strongly silicified quartz rhyolite and partially silicified / argillized volcanic agglomerate. The gold grade of all 21 composites averaged 0.0956 opt Au (3.28 g/t). The leach residue ("tailings") retained on average only 0.001 opt Au (0.034 g/t), ranging from 0.0005 opt Au (0.017 g/t) to 0.0027 opt Au (0.093 g/t), indicating that essentially all of the gold was soluble in cyanide. Although the bottle roll tests were run for 96 hours, almost all of the gold was leached in 24 to 48 hours. Cyanide consumption was very low in all of the bottle roll tests. Silver solubility was also encouraging, with an average silver cyanide solubility of 79% at an average head grade of 0.19 opt (6.5 g/t) Ag. Although silver is not a strong economic driver at the Bruner project, these silver extractions still bode well for silver contributing to the economics of the project, even at low silver grades. Metallic screen analyses performed on seven of the highest grade composite samples indicate high variance with standard head grade analyses but good correlation with calculated head grades from cyanide leach results, indicating the presence of particulate gold. However the test results indicate the particulate gold is all soluble in cyanide, indicating it must be relatively fine-grained. All of the test work referenced herein was performed by Kappes, Cassidy & Associates ("KCA") metallurgical laboratory located in Reno, Nevada, and summarized in a report from KCA dated March 2013. KCA is a world-renowned metallurgical testing laboratory specializing in cyanide leach processing.